Viking War of Clans is a free strategic multiplayer war game. Gather your friends and prepare yourself for an epic action packed battle. If you like this free game, try Throne: Kingdom at War. Plarium llc has developed numerous wonderful strategy games. Throne kingdom at war, Stormfall age of war and Vikings War of Clans are among the successful line of Plarium MMO games that were developed. In War of Clan, the north is the home of the Vikings, where Jarls (ruler of a Viking town) fight ruthlessly for conquest and expansion of their town. You were a stranger from a distant land who chanced upon a Viking town, near north. Unfortunately, the elders of the town had perished in the hands of a betrayer. Without a leader, the town became vulnerable and it was constantly bullied by neighbouring towns. Instead of joining the onslaught, you fight to preserve peace. A sensible ruler is needed by the people to bring peace and prosperity back to the Viking town. 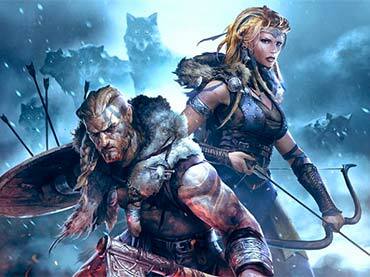 Similar to Stormfall age of War and Throne Kingdom at war, Vikings war of clans is a modern strategy game with traditional city-building gameplay. Like all MMO games, the objective of the game is to make your Viking town strong through conquest and expansion. By constructing important structures you can support your military and economy of your village. To be a powerful Viking tribe, your village will need skilful and agile warriors. Your people and warriors require basic resources such as food and shelter for training. Thus, resource management becomes a really important aspect of this browser game. At the start of this online game, you assume the role of a Jarl. Like all plarium games, you begin your journey with a comprehensive tutorial. During the tutorial, you will have a good grasp of the gameplay and be familiarised with the controls. There are two main views in this strategic MMO game. The first being the town view and the other being the global map view. Each town has its own set of unique coordinate that has their placements in the global map. The town view is used frequently throughout the gameplay while the global map only shows you the important structure around you. In Vikings War of Clans, buildings can be upgraded to higher levels for better efficiency training of your warriors. This also helps to increase the production yield of your resources. As you go deeper into the gameplay, you will find that this browser game has fascinating combat mechanics. Waging war against neighbouring towns is only a click away. Clicking them on your global map will send your troops marching off to the battle location. The result of the battle will be determined by several factors such as Army strength, Town level, Hero level and Wall level. As you expand your village through victorious conquest and resource buildings, you will increase the experience level of your character. Viking chiefs will gain skill points for a different quest. This will allow them to improve on either the warriors’ attributes or the effectiveness of resource production in their village. Another important aspect of increasing your attribute is through equipment crafting. This is where you get to customise your attributes and be equipped with the modified weapons from the forge. Often during battles, Viking chiefs will form an alliance with other towns to secure their wins. Despite your strong army of warriors, it wouldn't hurt joining a clan with like-minded warriors. Instead, this will make your forces stronger. One interesting feature of viking wars is that it has global PVP features. This allows you to easily engage in PVP battles with other Viking clans. With your new form clan, expand your conquest and engage in battle with other clans. In this MMO strategy game, plarium llc pays a lot of attention to the details of the graphics. Instead of static screens, the well-animated graphics brought the Viking town to life. While you are managing your town, it is really fun to look over and see all the little vikings doing their tasks. The graphics in Vikings war of clan are stunningly packed with excellent 3D visuals. The art and immersive music also aligned with the theme of the period and it greatly enhances the gameplay experience. Below are the top 5 helpful tips that would help you through the gameplay of Vikings War of Clans. Build as many farms as you can in this game and make sure that they are upgraded regularly. The bigger your troops, the more they will consume. The farm will produce the food required for your troop. However, you have to ensure that there is sufficient food being produced for your troops. Another neat trick is to send your troops on extended missions. During this period, no food will be needed from the farms. - Use Tier 1 troops to yield resources. You can easily loot resources by attacking town/kingdoms run by players who are no longer active. These are the places with resources but no defending troops. Normally the players that own the towns/kingdom are no longer active. Get yourself as many resources as you need. If your enemy clan has control over the place of power, you can channel more force towards it. Crush your enemies and gain more points for your clan. - Do not be greedy with your yield. Channelling majority of your troops to a resource yielding point during a battle may result in a total wipeout. Therefore, do not aggregate all your troops in a particular battle point. In conclusion, Vikings war of clans provides players with a meaningful work of building their own kingdom. Integrating different amazing way of hero attributes enhancement has given this typical MMO strategic game an interesting twist. In terms of graphics for a strategy game, Vikings war of clan definitely has one of the best graphics that was released. The pleasant thematic Viking soundtracks also compliment the gameplay. If you are bored of the classic MMO warfare, be sure to try out this fresh strategic war game, available for free. If you have questions about Vikings: War of Clans game, please contact us using this form.